Happy Black Friday, everyone! To celebrate, we’re releasing something very special today. 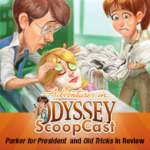 The Odyssey ScoopCast continues its series of Adventures in Odyssey Album 61, Without a Hitch! The Odyssey ScoopCast review series for Adventures in Odyssey Album 61 continues. The team discusses “Parker for President,” plot predictability, and the introduction of the character of Morrie. Plus, they also review “Old Tricks” and discuss the character of Buck Oliver, Eugene and Katrina, and great drama.